To print an ORDER FORM please click here. This collection of original biographies, published in English and French, profiles Canadian Aboriginal leaders whose accomplishments made possiblethe survival of their people and culture in the modern era. Written by some of Canada’s most experienced native writers, journalists, and specialists in Native Studies, these books are superbly illustrated with archival and contemporary photographs. 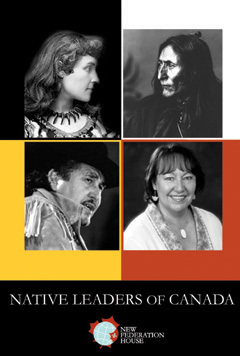 These unique volumes provide rare insights into the extraordinaryand sometimes tragic stories of Native leaders since Confederation. A panel of distinguished Native Advisors guided the publication of this original work. A complementary web site has been created which includes a a more complete listing of Aboriginal leaders. Click here to visit the Native Leaders of Canada site.